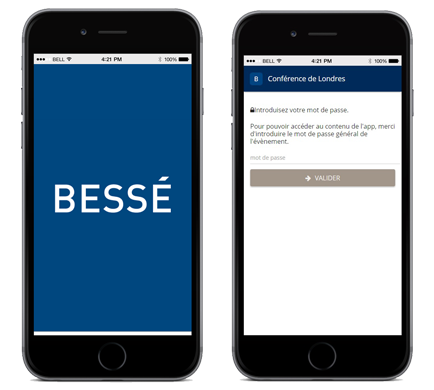 Insurance company Bessé, with branches in several European cities (Nantes, Paris and London) has developed a series of conferences for its employers, in which they have implemented and made available, a mobile app specifically developed to this end, with Eventool technology. Mobile applications for events and congresses, are not only a useful tool to facilitate information to all those taking part, but also promote interaction and keeping in contact with users at all times. In this example, the application was called ‘London Congress’, and once participants have downloaded from the virtual stores (Apple Store and Google Play), the first step is to obtain an access password, necessary to access all content in a private and secure environment. This is great way to keep information available only to those who need to know. Information. Contains general information of the event like general description, dates, web page or social networks, among others. Location. Shows the venue name and address, map location and options on how to get there. Agenda. List of sessions and activities. In this section, various options can be configured, like session name, description, start and finish time, speakers and associated resources and/or other relevant things. Speakers. List of all those speakers taking part in the event. In this case, they have also chosen to include information like speakers name, job title, organisation, biography, social network profiles and a lot more. Participants. List of event participants. These are able to register to the event app freely to be able to use it as a networking tool; or alternatively, the event organiser/Administrator can upload all participants to the app. There are a selection of fields available to use for this section, as well as the choice for participants to edit their personal entries. Documents. In this section, various documents are available and these could be uploaded in pdf, word, excel format. News. Latest news about the event or related subjects. Places of interest. Those relevant places that can be of use to the event participants, like hotels, restaurants, local tourist destinations and so on. Notifications. A specific section for those messages sent by the event app administrator. Usually used for updating participants of last minute changes in the agenda or other special circumstances that require fast and effective communication channels. Walls. An interactive section where participants can share questions and comments about the event with other users. Contact. Contact form that the app users can use to message the event organisers. All the information that the event app has, is manageable from the admin panel. Content can be modified easily at any time, and is automatically updated in the app.